LTE or “long Term Evolution”, which is the latest and greatest 4G wireless broadband technology that provides you a new Internet experience ideal for instant browsing without waiting, send and receive large files, stream videos, online gaming and more with blazing speed and superior reliability. “LTE Broadband” service is the perfect solution that is designed to enhance your online experience. 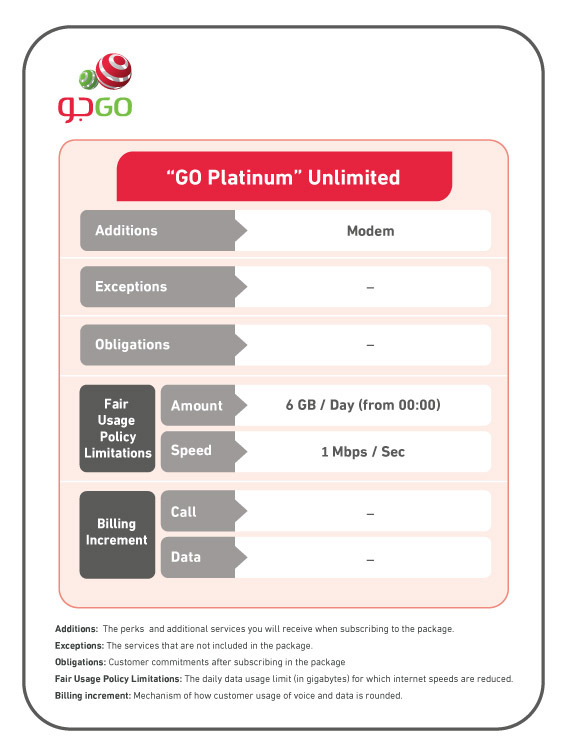 **GO Platinum Customer has unlimited download with Daily Fair Usage policy where speed will be throttled to 1 Mbps after the consumption of 6 GB per day.